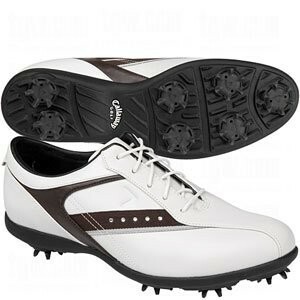 All joking aside, these shoes actually have some of Callaway's cool technology. The shoes are completely waterproof using a soft waterproof leather upper and their RainSport/Drysport technology. This technology provides the shoe with a moisture-wicking lining in a breathable waterproof system that is more comfortable than those old stiff leather shoes. Performance-wise, the shoes have a decent stability with great traction. However, these shoes run a bit narrow, and the toe is kind of pointy. For a wider shoe, check out Callaway's ultimate performance shoe: the Women's Hyperbolic Golf Shoe. This shoe comes with something called XWT technology. This is a forefoot pad that you can adjust to the width of each foot.